This campaign has concluded, but if you would like to still make a gift to support the Institute of Health + Wellness Design, please click here. The Haiti Birthing Center project is a unique, multi-term course and applied experience focused on the programming, design, documentation, prototyping, and transfer of knowledge for the construction of a community center in rural Haiti. Offered in partnership with Haiti Tec in Port-au-Prince, the Business and Technology Institute in Les Cayes, and the Maison de Naissance in Torbeck, student participants on this program will not only learn how to design a building from conception through construction documentation, they will also learn valuable skills in cross-cultural communication, community building, global practice, natural building methods, and project management. 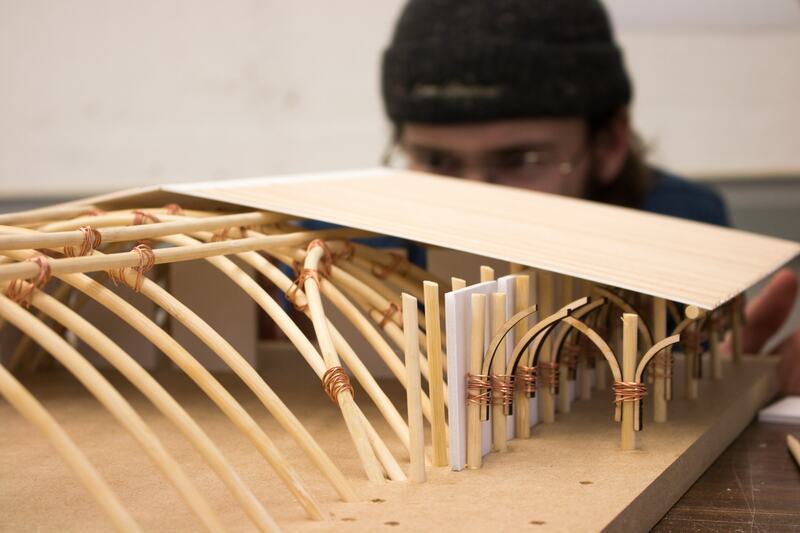 Ten students from the architecture and design programs are working this fall on the design of a 3,000-square foot center, exploring the potential of utilizing ecologically sound, local building materials, including bamboo and rammed earth. Three faculty with specific expertise in issues and applicable techniques are supporting the design process: Chad Kraus, Lance Rake, and Kent Spreckelmeyer. Six of the students will travel to Haiti between semesters to assist in the initial construction and to work with faculty and students from Haiti Tech and the Business and Technology Institute in Les Cayes. In preparation for their travels the students will be working with Cecile Accilien, Associate Professor of Haitian Studies to understand the culture and social context of life in the country. The students will be receiving travel-abroad credits for their experience. Please consider a gift of any size, which will be used to help cover travel and on-site living expenses for the KU students. The principal on-site partner, Maison de Naissance, is a modern and culturally appropriate maternal health center in Torbeck, Haiti. The center provides a full suite of maternal health services and deliveries at little to no charge to impoverished women who would otherwise have no access to this care. Maison de Naissance is sponsored by Global Birthing Home Foundation, a 501(c)3 non-profit public charity based in Leawood, KS.